If you play video games, you have played Grand Theft Auto V, and you know that it is one of the best—if not the best—game of 2013. It’s funny and it’s action packed and it’s basically an endless run through a fictionalized version of Los Angeles. How great is that? Yes it’s overly violent and very misogynistic, but the game is a lot of fun despite its intellectual flaws. Which is why we’ve probably all played GTA V so much. Admit it, you’ve spent an entire day or weekend or maybe even almost-a-week’s worth of free time sitting in front of your television, going on crazy bank robbing missions and stealing various vehicles as Michael, Franklin, or Trevor. You thought the Hollywood Sign was misspelled. You’ve bumped your car into a telephone pole and didn’t think twice about it. You’ve been considering doing yoga at the top of Runyon because your wife’s yogi told you to. You’ve told a friend in from out of town that they should visit the Kortz Center for good art and great views. You have considered taking a Metro train to Beverly Hills but are confused that there isn’t actually a Metro train to take you there. You’ve considered getting coffee at Cool Beans instead of your usual joint. You are personally offended that Lindsay Lohan thinks she is in some way a part of GTA V.
You’ve tried to find FlyLo FM or Soulwax FM on your car radio. You’ve seen a driverless motorcycle and thought, I should take that for a spin. 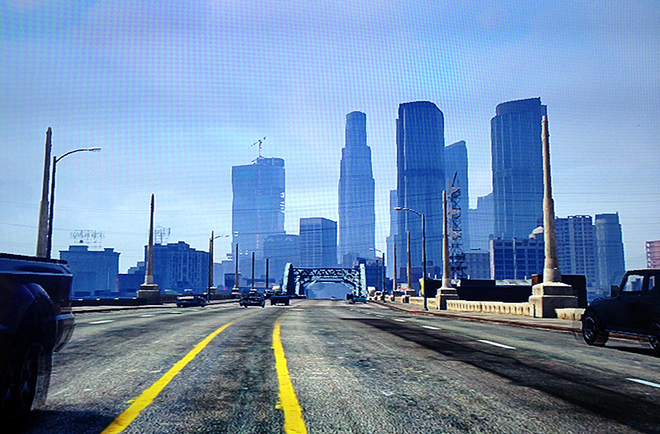 You’ve gone days without driving or walking or going outside at all in Los Angeles because you’ve done so much of that lately, in Los Santos. The Standard isn’t generic enough for you. You named your dog Chop. You’ve tried to purchase someone a copy of Chains Of Intimacy but can’t seem to locate it on Amazon. You’d estimate it costs less than $50 to take a cab from LAX to Beverly Hills. When you hear sirens, your instinct is to run around the block once. You wish you were speeding. All the time. Because speed limits are fake. You’ve been to Gentry Manor but not the Chateau Marmont. You have sat on your couch and watched a video character sit on his couch and watch an episode of Republican Space Rangers. Convinced now that you need a break from Grand Theft Auto or simply want to play it in a different way? If quitting cold turkey and re-immersing yourself in real L.A. culture sounds too ambitious, then here, play it this way. Kyle Fitzpatrick is a writer, an infrequent performer, and a lover of dogs, art, shorts, champagne, and L.A. You can find his musings Fridays on CityThink. For more, check out his locally focused art, design, and culture website, Los Angeles, I’m Yours, or follow him on Twitter and Instagram. The 10 Friendliest Places in L.A.